The AFG 2.0 AT folding treadmill is a mid-priced unit from Johnson Fitness, the same company that makes Horizon, Livestrong, and Vision treadmills. This is a good treadmill but it tends to be overlooked in the pack. 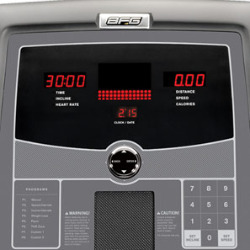 The console has an LED brickyard display with two 4-digit LEDs that show readouts for time, distance, calories, speed, incline, and heart rate. The pre-set programs of the AFG 2.0 AT folding treadmill include Manual, Speed Intervals, Incline Intervals, Weight Loss, Pacer, HRC, and Custom 1 & 2. UPDATE: The AFG 2.0 AT treadmill has been discontinued. You can take a look at all of the most popular models for sale here to compare specs and prices. 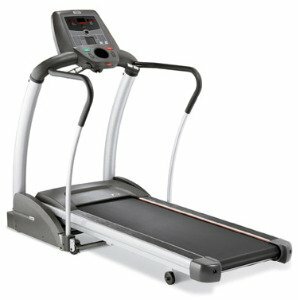 The AFG 2.0 AT folding treadmill offers a 55" tread belt, a 1.6mm thick belt, and standard cushioning and suspension. The frame is made from heavy gauge steel and is backed by a lifetime warranty. 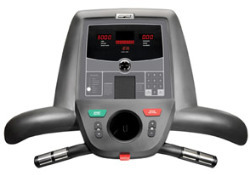 It also has a quiet running 2.5 horsepower continuous duty motor, 10 mph max speed, 10 levels of incline in .5% increments, a 250-lb user capacity, contact grip heart rate sensors on the front handlebars, and programs designed for running. Not a lot of reviews on this folding treadmill but we can tell you that it does not come with the type of entertainment system that has become standard in most units at this price. The AFG 2.0 AT has an iPod holder so you can put your device down securely, and plug in a set of headphones into the console, but there are no integrated speakers. Also, it lacks an in-console fan and wireless HR monitoring, as well as HR control programs. The AFG 2.0 AT folding treadmill is a quality unit sale priced at $1,399 that matches dozens of competitor model specs of a 2.5 chp motor and 20" x 55" tread belt for the same price. It offers everything you need in terms of mechanical design, especially in the areas of power, cushioning, programs, value, and warranty. However, a Livestrong, Smooth, Sole or Yowza will give you at least that much and more. If you want a few more entertainment features on a treadmill you’ll be spending many many hours on, you may want to check out the above-mentioned machines first before deciding on the AFG 2.0 AT.